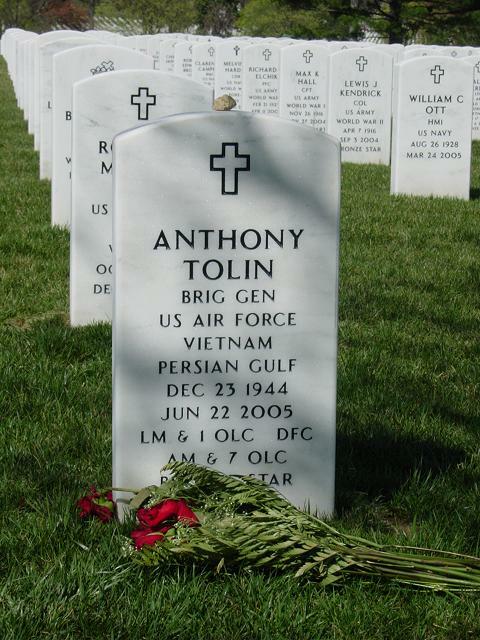 Brigadier General Anthony J. Tolin was Deputy Director for Strategy and Policy, Joint Staff, (J-5), Washington, D.C. The General was born in London. He was commissioned through the Air Force Reserve Officer Training Corps program at Louisiana Tech University. He has flown combat in the Vietnam conflict and Operation Desert Storm. He has commanded two wings, the 37th Tactical Fighter Wing (F-117A's) and the 57th Wing. He is a command pilot with more than 5,000 hours, principally in fighter aircraft. 7. September 1981 - June 1985, action officer, Deputy Chief of Staff for Plans and Operations; and member, Air Force Chief of Staff's Staff Group, Headquarters U.S. Air Force, Washington, D.C.
13. August 1993 - present, deputy director for strategy and policy), Joint Staff, J-5, Washington, D.C.